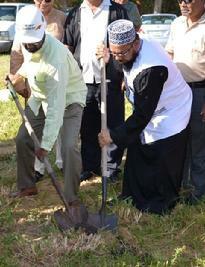 Al-Hamdulillaah, Masjid Al-Amin held their Ground Breaking Ceremony at South Military Trail, Boynton Beach Florida U.S.A.- followed by a Shukrana Program and Dinner at Mehfil Restaurant, Sunrise Florida U.S.A. The event was a great success! There were approximately 400 people who attended the event. 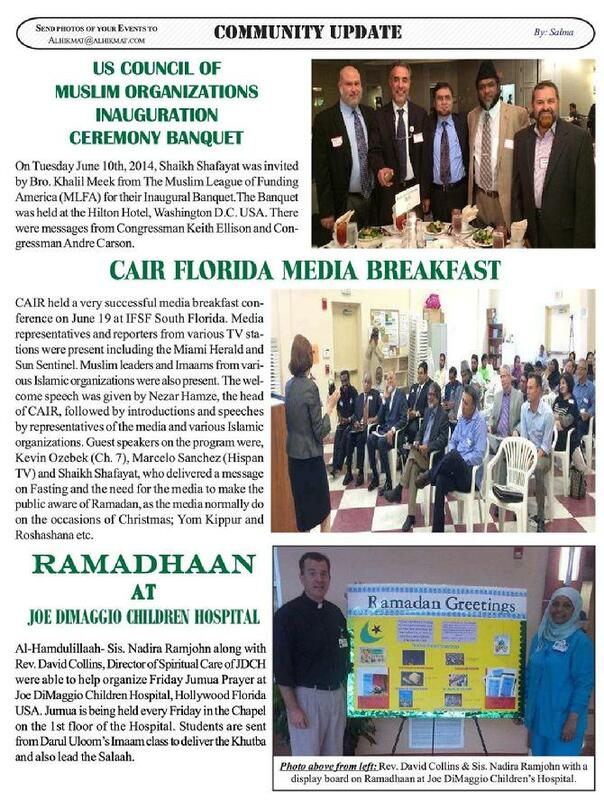 The event was coordinated by Al-Hikmat Services Inc.
On Saturday November 3rd, 2012 The Muslim Community Association of South Florida held their fundraising dinner at Mehfil Restaurant to expand their Masjid - Islamic Center of Greater Miami. There were over 400 in attendance. Shaikh Shafayat was the Fundraising guest speaker. Al-Hamdulillaah the target of $300,000 was raised. Maashaa Allaah. 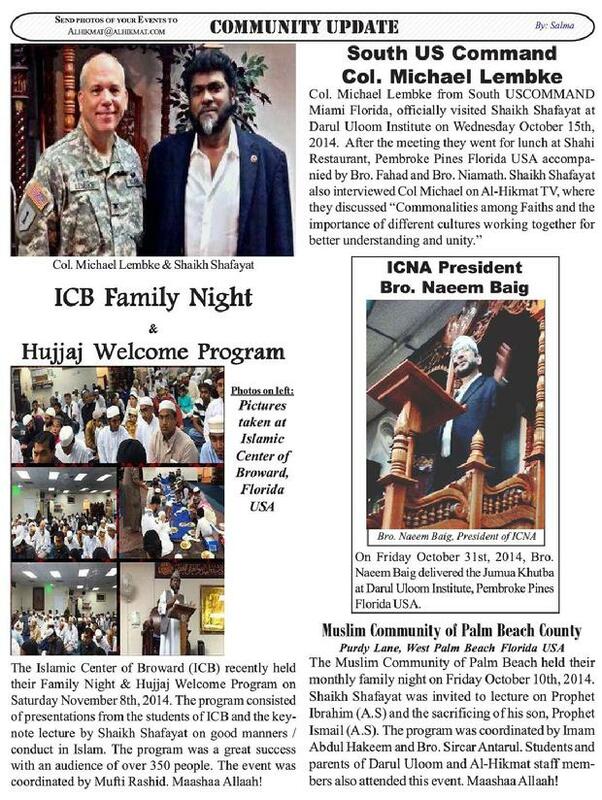 On Sunday January 13th, 2013 Shaikh Shafayat was invited to Valencia Shores - NCJW (National Council of Jewish Women) in Lake Worth, Florida USA to speak about "Women in the Religion of Islam." 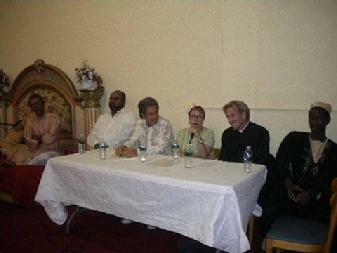 Along with him were speakers from different faiths such as Father Galant and Rabbi Barry Silver. On Saturday April 8th, 2012 Shaikh Shafayat was invited by Rabbi Barry Silver, to celebrate the Jewish occasion of Passover at the home of his mother. Passover begins on the 15th day of the month of Nisan in the Jewish calendar (spring in the Northern Hemisphere) and is celebrated for seven or eight days. It is one of the most widely observed Jewish holidays. 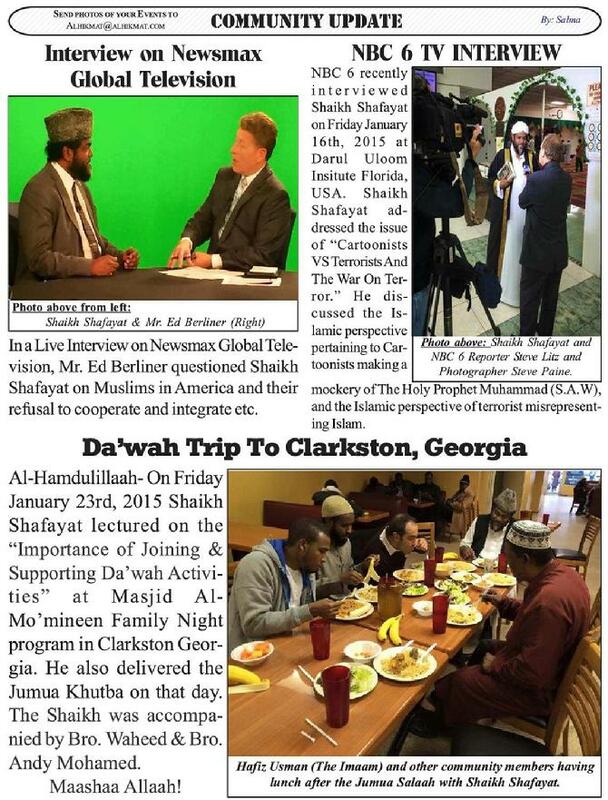 On Saturday March 30th, 2012 Al-Hikmat TV was invited by Bro. Tausif Malik to Broadcast Live the World’s First Muslim Spelling Bee Competition at American Youth Academy, Tampa, Florida. The objective of this event was to have students participation in local, national and international educational competitions. The World’s First Muslim Spelling Bee Competition connected Communities across North America, U.K, Dubai, Australia, South Africa, New Zealand and Asia. The event was a great success. 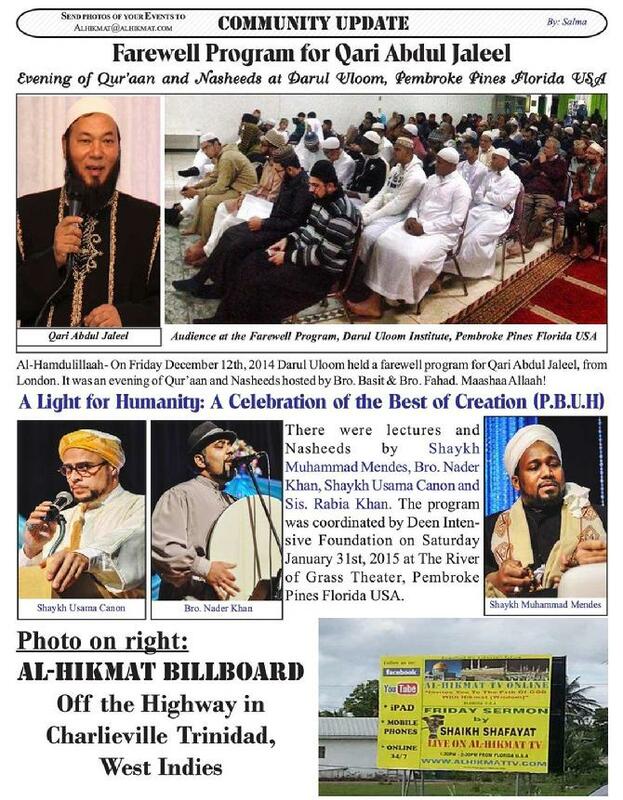 On Sunday March 25th, 2012 Shaikh Shafayat was invited by JAM & All at the Art Serve Auditorium, Ft. Lauderdale Florida U.S.A. to celebrate their 10th Anniversary. The event was a great success! Mr. David & Mrs. Jane Kamrat and Shaikh Shafayat were awarded as the Co-Founders of JAM. The event also recognized the late Dr. Flourence M. Ross for all her hard work. Photo on Left: Sis. 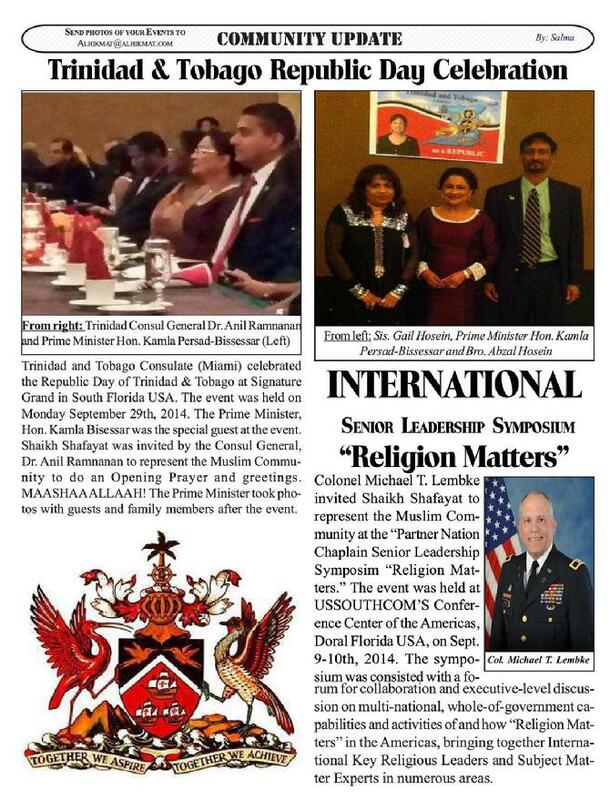 Karen Shah received the Award on behalf of Shaikh Shafayat who was in Bangladesh at the time of the event. On Tuesday February 7th, 2012 Rabbi Barry Silver, Father Joe Gallant and Shaikh Shafayat was invited on behalf of ILIR at the Unitarian/Universalist Fellowship of Boca Raton, Florida U.S.A. by Mr. Bob Israel. 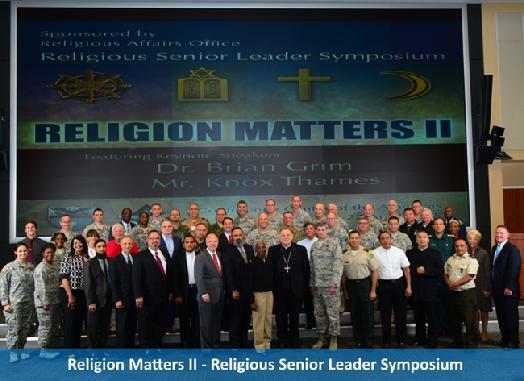 The religious leaders spoke on their faiths and other religions. The Institute for Learning in Retirement, Inc. (ILIR) is a non-profit organization devoted to providing stimulating participatory education for residents in the Boca Raton, Delray and Boynton Beach towns, and adjacent Palm Beach County areas. On January 15th Temple Sinai in Hollywood proudly hosted Part 2 of “Bet You Didn’t Know That About Islam!” This program was offered by the Broward Interfaith Council, and was attended by members of many faiths. Bro. Wayne Shah gave an informative slide presentation, answered many questions from the audience, and facilitated an enthusiastic discussion. This program was requested as a follow-up to Bro. Wayne’s successful first presentation on Islam back in October. 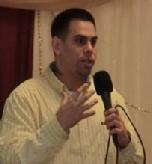 Anthony Sampedro, a convert to Islam, visited GIT – Guyana Islam Institute in January 2012 with Shaikh Shafayat. After spending some time with the students, Anthony became convinced of and motivated to study Islam, Inshaa Allaah. Anthony better known as Abdullah is now studying Qur’aanic Arabic etc. 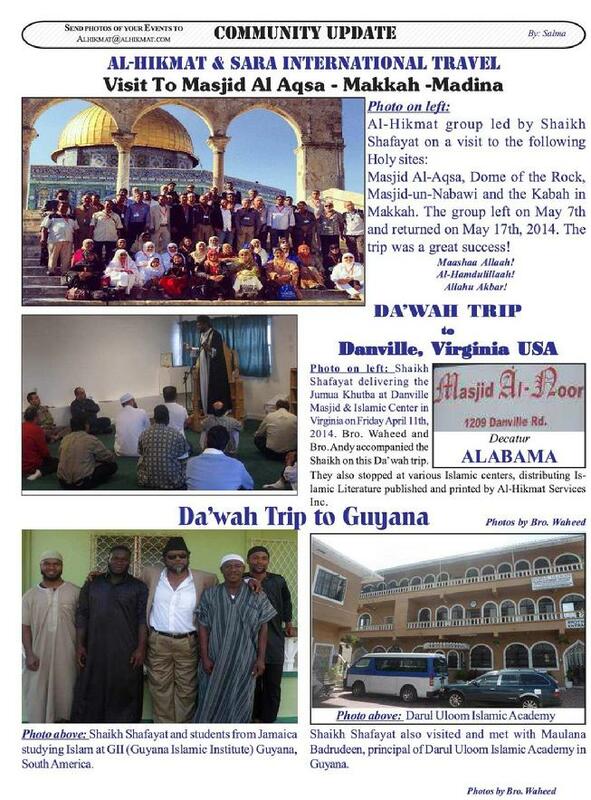 at Darul Uloom Florida, U.S.A. Al-Hamdulillaah. Sunnat-ul-Jammat of Queens, New York invited Shaikh Shafayat on Dec. 4th, 2011, to do the fundraising lecture for a New Fire Alarm System, which cost approximately US $40,000. Over 1200 tickets were sold for the fundraising dinner. Imaam Ahmad Ali was the MC, while Shaikh Rafeeq and Shaikh Naseem both lectured before Shaikh Shafayat did the fundraising lecture. Al-Hamdulillaah, the funds were raised and the mission was accomplished according to the President, Bro. Mohamed Fazal Khan, Mashaa Allaah. 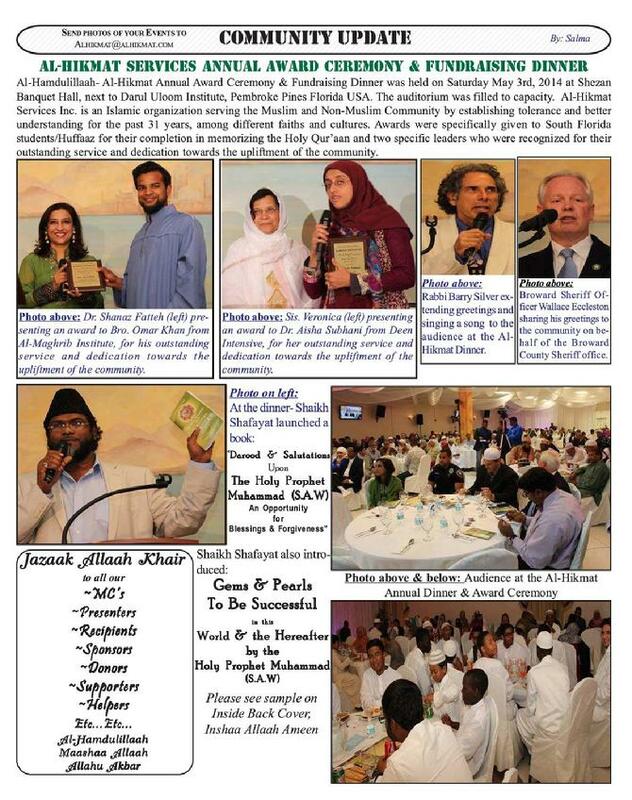 On Dec. 10th, 2011 UHI Medical Center of Miami Florida U.S.A. held its annual fundraising banquet at Mehfil Restaurant. The target was US $175,000, but Al-Hamdulillaah US $215,000 were raised in less than 20 minutes. The fundraising guest speaker was Shaikh Shafayat. UHI Medical Center opens Mon.-Fri. from 10:00am - 6:00pm and on Sat. from 10:00am to 2:00pm. Approximately, 34 Physicians volunteer their time to serve the community at No Cost. The MC at the dinner was Dr. Tehsin Siddiqui, followed with presentations by Bro. Sadrul Fasihi, Dr. Imran Siddiqui, Bro. Khalid Mirza, Dr. Subhani, Dr. Alam, Bro. Syed Zafar, Bro. 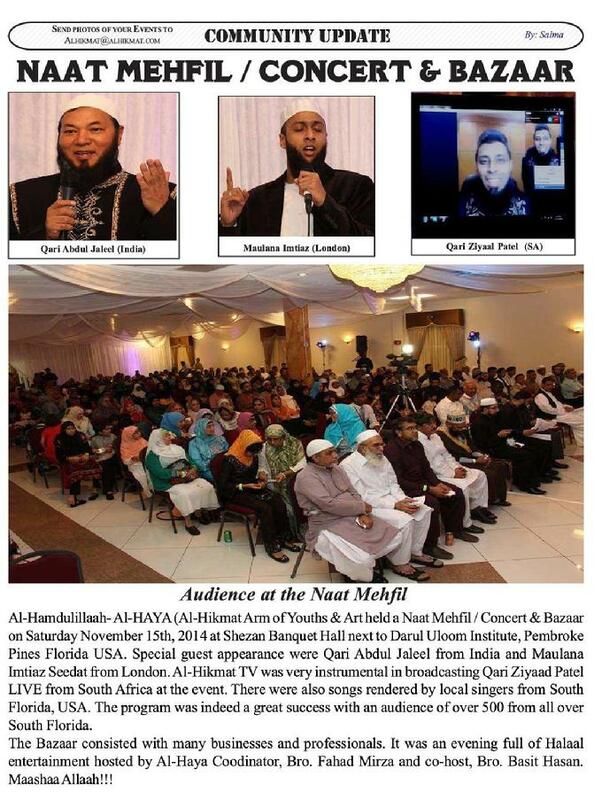 Songerwala and a Keynote address by Dr. Mohsin Jaffer, Mashaa Allaah. Sun. 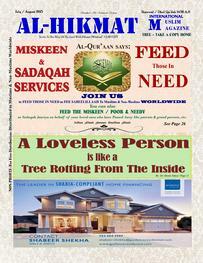 Nov. 13th, 2011 @ Darul Uloom Institute, Pembroke Pines Florida U.S.A.
On Sun. Nov. 13th, 2011 Al-Hikmat Youths and Darul Uloom Institute students held an Ebrahamic Eid Feast at Darul Uloom Institute. The guest speakers were Dr. Mohsin Jaffer, Rabbi Jeffrey Kurtz-Lendner and Rev. Keith Spencer. There were performances from The Sunday Madrasah students, Darul Uloom Weekend Hifz students and AL-HAYA Youths. Approximately, 350-400 people were in attendance. The food was sponsored by parents of the students and youths. Greetings were given by Bro. Azad Ali, introduction of the guest speakers by Bro. Farooq Shafi and an Interfaith Quiz moderated by Sis. Karen Shah, while the event was coordinated by Shaikh Shafayat. Bro. Wayne having a Halaqa session with some new Muslim brothers. Shaikh Shafayat talking to converts who are planning to go abroad to study, Inshaa Allaah. 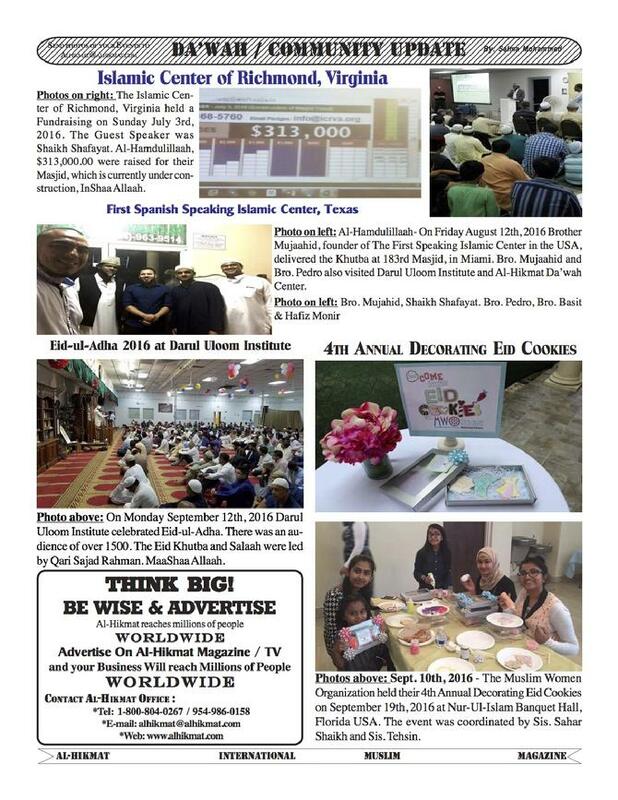 The Islamic Foundation of South Florida raised over $375,000.00 at their fundraising event on the 27th Night of Ramadhaan. IFSF Masjid and school is a beautiful facility located near I-75 and Commercial blvd. in South Florida U.S.A. The MC of the program was Bro. Javed Qureshi, while Dr. Zahid, the Chairman gave greetings and other board members updated the audience on the financial status of IFSF. The target was $300,000.00 but, Al-Hamdulillaah over $375,000.00 was raised Mashaa Allaah. The fundraising guest speaker was Shaikh Shafayat. IAMC held a fund-raising program with Iftaar and Dinner at Mehfil Restaurant, Florida U.S.A. Al-Hamdulillaah, the target of $30,000 was raised by Shaikh Shafayat, the guest speaker in approximately 10-15 minutes, Mashaa Allaah. The mission of IAMC is to promote peace, pluralism and social justice through strategic advocacy. APPNA - Association of Physicians of Pakistani Decent of North America held their 34th Annual Summer Convention at the St. Louis Convention Center in Missouri, U.S.A on June 29th to July 3rd, 2011. There was an audience of over 2,000 people. The President- Dr. Manzoor Tariq invited Shaikh Shafayat to deliver the Jummua Khutbah at the Convention. Islamic Center of Little Rock, Arkansas, U.S.A.
On Sunday June 19th, 2011 Darul Uloom Institute held a student Jalsa for the Sunday Madrasah and the Weekend Hifz-ul-Qur’aan students. There were different performances from the students such as, Qur’aan Recitation, Hadith, songs, poems etc. vAuditorium/Decorations vAudio/Video vPreparation of Meals vSponsoring of Tables vPurchasing of Seats vDonations etc. v Soft Drinks vHors d'oeuvres etc. etc. etc. Special Thanks to all Recipients and Presenters for making themselves available to attend the Al-Hikmat Annual Dinner & Award Ceremony 2011. On Thursday May 5th, 2011, Sheriff Al Lamberti once more ensured that a prayer service be held at the Broward Sheriff’s Office. The event was coordinated by Chaplain Rick Braswell. Spiritual leaders from various religious institutions were invited to do a prayer and represent their faiths. Shaikh Shafayat represented the Muslim Community at the service. Photo from left: Bro. 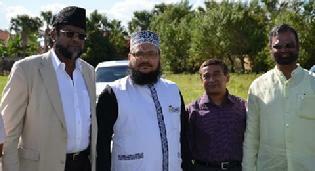 Hamza Patterson, Shaikh Shafayat, Sheikh AR Green & Imam Mohammed Islam. Masjid As-Salaam held an Islamic Convention on May 13th - 15th, 2011 in Kingston, Jamaica on “Islam & Terrorism.” The topics discussed were: Islam & Terrorism by Sheikh AR Green, Paradise Lies at the Feet of your Mother by Dr. Rashid Malik, My Journey to Islam by Bro. Hamza Patterson and Prophet Muhammad (S.A.W) of Islam (Political life/Spiritual life) by Shaikh Shafayat. Bro. Wayne and Bro. 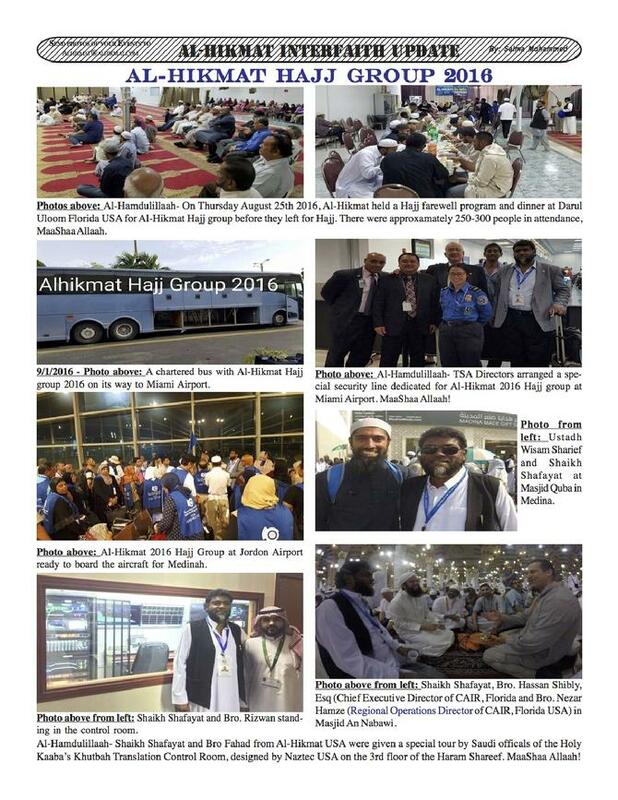 Mike Shah from Florida accompanied Shaikh Shafayat to the Convention. Dr. Rashid Malik - Georgia U.S.
December 18th, 2010 @ The Pavilion in Sheridan - 2801 N. University Drive, Florida U.S.A.
Al-Hamdulillaah, Al-Hikmat Services held its First Annual Bazaar and Picnic/BBQ on Saturday Dec. 4th, 2010. Despite the weather the event was a huge success! There were various vendors from a wide cross section of the community selling Indian delicacies clothing, and books etc. The BBQ was the main attraction which had a constant flow of customers. Other attractions included games and an auction. The highlight at the end included winners of the following prizes: Bro. Multan won 4 Ringling Bros. (circus) tickets, and a Blue Ray DVD player, Farah Mohammed won 2 Miami Heat tickets, and Sis. Zaleka Rashied won a mountain bike. Bro. Farzan of Masjid Al-Hijrah and Bro. Mustapha of Masjid Al-Mu'mineen shared the responsibility of MC at the event. Sis. Zorie & Sis. Mazmoon steaming the chicken for Bar-B-Que coordinated by Bro. Abzal Hosein. Bro. Nazir, Bro. Wayne, Bro. Waheed, Bro. Mikey, Bro. Naim & Bro. Moonir were on the Bar-B-Que grills- coordinated by Bro. Shah. Sis. Atiya of Asiana Foods selling clothes and jewelry at the Bazaar. Darul Uloom in collaboration with Al-Hikmat Services, held an Eid-ul-Adha feast and Hajj welcome program on December 4th, 2010. Over 300 people attended this event which included performances by the Darul-Uloom Hafiz program as well as the Sunday Madrassah. 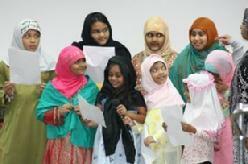 PHOTO ABOVE From left: Salima, Sadia, Salisha, Saffiya, Farah, Sabeha, Sana, Saffiya & Zaria singing a song led by Sis. Sibgha. Photo Above: Some of the brothers and sisters from Al-Hikmat Hajj group taking a rest before Tawaaf in the Holy Mosque in Makkah on November 13th, 2010. 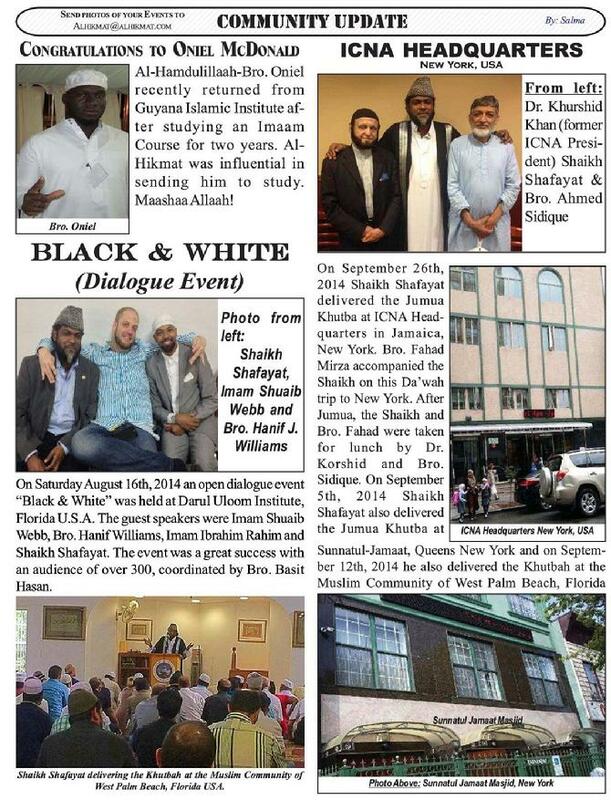 Hajj farewell program at Darul Uloom Institute, Pembroke Pines Florida for the Al-Hikmat Hajj Group 2010.
a brief preview on Hajj from the youths of Al-HAYA and a presentation of the Hajj pilgrims. Photo Above: Shaikh Shafayat welcoming the audience before the youths debate. comments and views on the Preacher who plans to burn the Qur'aan on 9/11. The program was a resounding success with a crowd of approximately 600 people. LIVE on the Al-Hikmat TV. 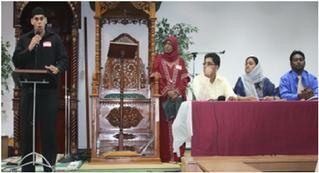 Before the interfaith leaders spoke, there was a debate by Al-Hikmat youths coordinated by Sister Naima Khan-Ghany. 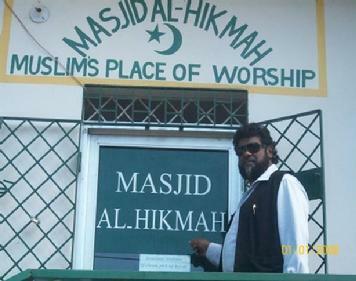 MASJID AL-HIKMAH Shaikh Shafayat at Masjid Al-Hikmah in JamaicaJuly 2010 - In a recent Da’wah trip to Jamaica, Shaikh Shafayat held talks with representatives of various Mosques pertaining to arranging Scholarships and Financial Aid for students interested in studying Islam. On Sunday June 6th 2010, Darul Uloom Institute held their student’s Jalsa, to mark the end of the school year. 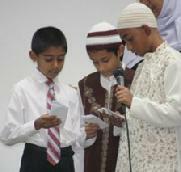 The Jalsa had performances by the students on, Qur’aan Recitation, skits, poems, songs etc. There was a wonderful support from the parents and also a congregation from the Fulford United Methodist Church of Miami, Florida. In addition, there were special presentations for a few volunteers of the Sunday Madrasah, for their hardwork and time. Students singing a song, led by Sis. Nabilah and Sis. Salma. Congregation members from the Fulford United Methodist Church, listening attentively to the performances of the Sunday Madrasah Students. Some of the Madrasah Students. Al-Hamdulillaah, Al-Hikmat Annual Dinner and Award Ceremony was a success, Mashaa Allaah! In addition to all fifty tables sold, the audience were treated with greetings from prominent officials of South Florida. Broward Sheriff Office. They all gave their greetings and comments, followed by a lecture delivered by Sheriff Al Lamberti. was brother Farooq Shafi, while the introduction of the recipients were done by brother Azad Ali. This event was broadcasted LIVE for viewers all over the world. from Non-Muslim Students at their Islamic Awareness Week. Other topics scheduled for the week: Muslim Women Leaders, Science/Islam and Jihad - The Inner Struggle.